One of the recently discovered beach destinations of West Bengal is fast becoming popular. 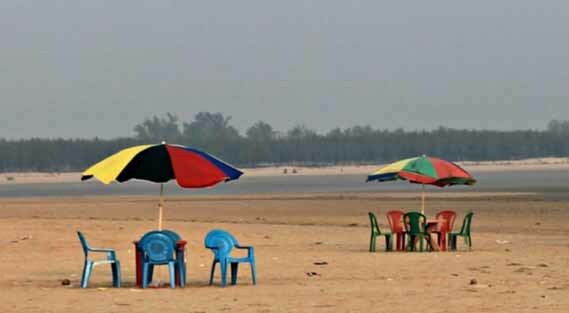 Digha and Mandarmani, the other two well known and popular beaches nearby may have better facilities for tourists, but the kind of virginity and secludedness that the beach of Tajpur offers is unique of its kind. The untouched beach of Tajpur fringed by dense forest of Tamarisk and Casuarinas trees provides an ideal setting for a relaxed weekend holiday away from the humdrum of the city life. There are so many things to do at Tajpur Sea Beach like rafting, beach cycling, parasailing etc. Para-sailing Beach sport of Tajpur is the most adventurous because one should jump to Sea from the para-suit. Except, beach sports at Tajpur Sea Beach, tourists would get to see Red Crabs on the beach, hundreds of 'Jhau' Trees filling with enchanting birds and extremely beautiful & clean Sea Beach for sun-bath. Tajpur is an ideal place to relax and rejuvenate far away from the maddening city crowds. The untouched and unspoiled beauty of the Tajpur beach surrounded by greenery seems to be a piece of land out of this world. The virgin beach of Tajpur with white sand, blue water and infinite number of red crabs playing hide and seek is truly a place to have a dream weekend. The secludedness of the Tajpur beach will at times make you feel that you own the beach. Tajpur is a practically unknown sea-beach of unmolested virginity which does not draw maddening crowds like Digha or even like nearby Mandarmoni and Shankarpur. The beach is beautifully fringed by dense casuarinas and eucalyptus trees and it is so secluded that one may get a feeling of 'owning' the beach. Digha Beach, located in the proximity, is referred to as 'Brighton of the East'. The low gradient with a shallow sand beach extends 7 km in length. The beach gives a beautiful view of sunrise and sunset. It is a safe beach for swimming as sea at Digha is calm and shallow for about a mile from the beach. Highlight of the beach is the Casuarinas plantations along the sea shore. Identified as Beerkul during colonial rule, the beach resort has early mentions as a Brighton of the East. Thereafter in 1923, English tourist John Frank Smith settled at this place. Thousands of small crabs crawl around the 13 km. long virgin beach making it look like a simmering field of the red flower Mandar. Years ago the resemblance ignited the imagination of the locals. They named it Mandarboni. In course of time it has become Mandarmani. Mandarmani is a large and fast developing seaside resort village in the state of West Bengal, India. It lies in East Midnapore district and at the northern end of the Bay of Bengal. Mandarmani is connected to Kolkata/Howrah by a highway. It is argued to be the longest driveable beach In India. Shankarpur is a beach village in East Medinipur district of West Bengal. Shankarpur is about 185 km from Kolkata and is touted to have the best beach In Eastern India. Shankarpur, a virgin beach as yet, is a recent discovery. It is a twin beach of Digha, around 14 km from Digha, along the Digha-Contai Road. Shankarpur has to its credit all the advantages of Digha, minus the crowd. Casuarina groves by the side of a gentle sea and good climate round the year make it a popular beach destination. Apart from the long, tree-lined beach, the main attraction is the Shankarpur Fishing HarbourProject.This beach is mostly empty except on weekends. The mornings are cool, when fishermen can be seen hauling their huge nets out of the sea. The morning sun reflecting on the sea waves in the east, and the local fish-boats on the coast offer excellent photographic opportunities. Chandaneswar is a place in South 24 Parganas District of West Bengal in India. Chandaneshwar is in Balasore district of Orissa. Regular transport is available from Jaleswar in Orissa and Digha in West Bengal. It is very near to New Digha, One can go from Digha to New Digha Bus stand by bus/Auto then take shared auto /van rickshow for Temple.